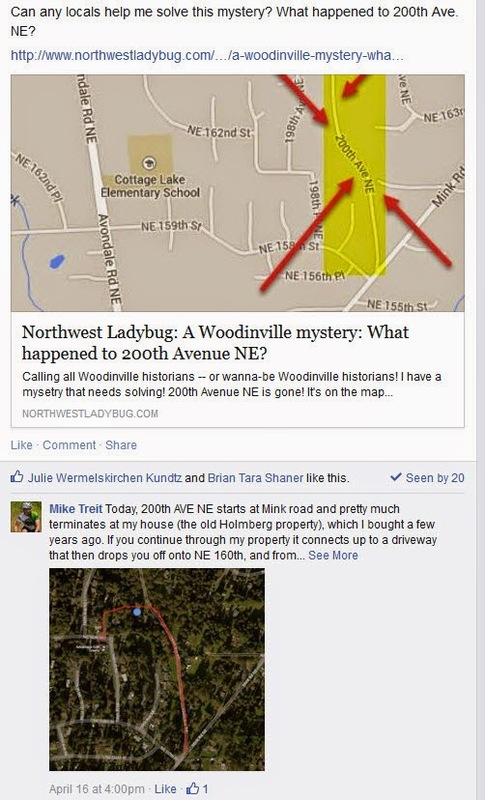 Northwest Ladybug: A Woodinville mystery: What happened to 200th Avenue NE? 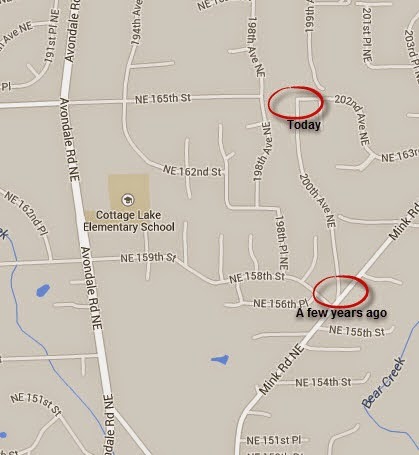 A Woodinville mystery: What happened to 200th Avenue NE? Calling all Woodinville historians -- or wanna-be Woodinville historians! I have a mystery that needs solving! 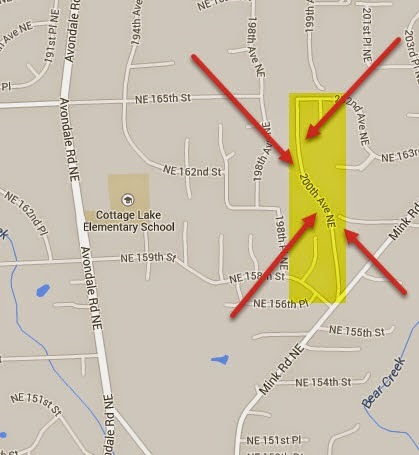 200th Avenue NE is gone! ...but in actuality, it's nowhere to be found! Today I decided to explore the mystery road from the other end. There's a trail from the end of 165th to 202nd, which the dogs and I take often. Hmmmm. It doesn't look much like a road... but it doesn't really look like private property, either! Trailblazers that we are (pfffft! ), Quinn, Shasta, and I decided to head down the...um, road. At this point I didn't really feel like we were trespassing. The row of trees on the left seem to clearly delineate a property line, so we kept walking. I even noticed what looked like the remnants of a road. As we kept walking, I began to feel more and more like we were trespassing. After all, we were definitely walking in, or at least along the edges of people's property. 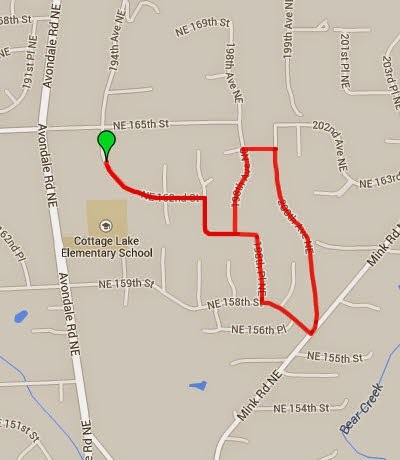 At this point I decided to open Google Maps on my phone so I could be sure to follow the "road." Aaaaand, this is where we turned around. This wasn't even a trail anymore! and I definitely felt at that point like we were trespassing! So after multiple attempts now, I have never walked the full length of 200th Avenue NE - because the dang road doesn't seem to exist! Can anyone provide any clues here? Is there a story waiting to be told? Or is this just the road that never was? Mystery solved, thanks to a guy in our neighborhood Facebook group!! 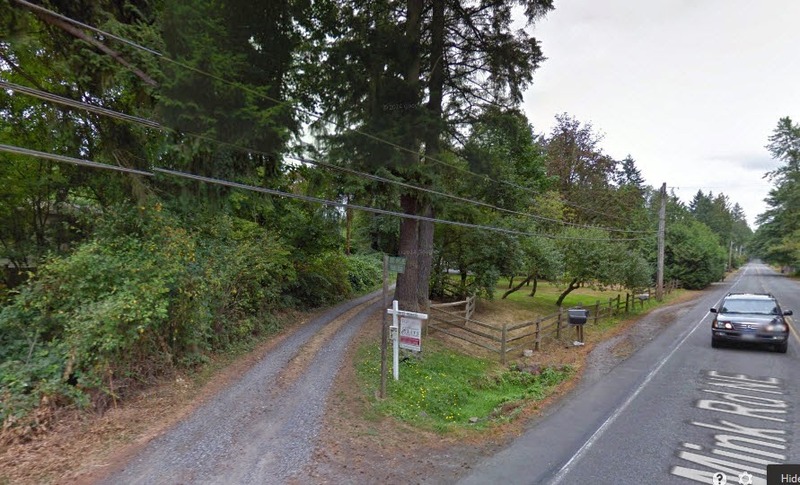 Mike posted a map showing 200th Ave NE from Mink Road ends at his driveway, where there's a dirt road that goes right back into our immediate neighborhood. At the top of the dirt road, we found ourselves on someone else's driveway (yes, I kinda still felt like we were trespassing) and that driveway dropped us right onto 160th! Pretty cool! That is downright strange. I wonder if the peoples property has been surveyed recently. that still doesn't explain why the road on the map doesn't exist in reality?